This year we are keeping things pretty straight forward as far as classes go. Madison is taking Prealebra 2, and then Intro to Algebra A, Critical Reading and Writing, Biology, World Geography, and Philosophy. She is also continuing Wordly Wise Book 8. So far this year has been busy, but great. She is currently getting A’s in all of her classes. Madison was excited to get her Invisalign and has been doing a great job wearing her trays. Raising Madison has been a trip. She’s a trip. There’s no other way to explain it really. In a nutshell, I had no idea what I was getting myself into when I agreed to homeschool her. I had no idea what she could accomplish was even possible and I second guessed myself a lot along the way. I stayed up at night worrying and even woke up in sweats from fear of making the wrong choice. Faith. Having faith is what got us to where we are today. Faith in Madison and in myself. It was actually easier to have faith in her than it was to have it in myself. I chose the picture of her on her first day of Second grade. This was our first year of homeschooling. She hated public school. I will always regret making her go. She went for two years and begged and cried all through First grade begging me to homeschool her. We had her tested and advocated to no avail, so I agreed. She joined Mensa at the age of 6 in hopes of finding connections and for me to find support. I did a lot of research and found really good groups online to help. I started this blog to document our journey and I am SO glad I did. When we started out I told her that she could go as slow as she wanted and could have a ton of free time or as fast as she wanted. She chose fast. She hasn’t deviated from that at all. I learned very quickly that Madison only has to learn something once and she’s got it. She doesn’t need to review. Unless it’s Math. That’s a different story. That was a hard concept for me to grasp. That it was possible for someone to be able to do that. I was questioned pretty hard by my family when we made this choice, so at the end of Second grade, I tested her with the Iowa Basic Skills Test for Second grade. That was a joke, she maxed the entire thing out. So, at the beginning of Third grade I gave her the Fourth grade Iowa. Again, maxed it out. I waited until the end of Fourth grade and gave her the Seventh grade Iowa. She didn’t max it out, but she passed with flying colors. At that point I decided we were good and I didn’t need to test her again and I haven’t. Family was appeased. I was freaked out. We utilized advance curriculum for awhile and did all the hands on homeschooling events we could. The science museum, orchestra, art museum, etc. She had a blast, but they got repetitive after awhile. During this time, I really had to learn to trust her. I would have to ask her what she already knew, because she didn’t want to waste time relearning it. It was a very scary time for me. I just had to pray I was doing the right thing. During this time I also let her choose what she wanted to learn. Our paths connected with a group of people who who had PG children (profundity gifted.) They spoke of the Davidson Young Scholar Program and how much support it provided. I had just had Madison retested through our psychologist for a neurological evaluation and she qualified for this program, but I was intimidated for applying for some reason. I was already overwhelmed and it seemed like extra work, but with encouragement, I did. Thank God I did. When Madison was accepted, the doors started opening. It was like the clouds parted for the sun to shine through. I knew that there would be a point when I could no longer teach Madison. Ha! That statement isn’t really true, let me rephrase that. I knew there would come a time when Madison wouldn’t be able to solely teach herself. 😉 I was waiting to sign her up for online courses until that time, because they were expensive. It works so much better for us when she has a teacher and a classroom, even if it’s online. I’m not a teacher, I never was, and I never will be. LOL. I’m ok with that. I am a facilitator for Madison’s education. That’s always been my role and will continue to be. She wants to go to college when she’s 12. That’s been her goal from day one. We have her enrolled in the Duke Tip 7th grade talent program and she’s scheduled to take the ACT next year. We did a practice test without prep and she did very well. Her goal is to start dual credit classes online through the community college. That’s her goal. So, if she can pass the ACT so I have some scores to take to them that either they’ll accept or will convince them to let her take the TSI then I think we have a path laid out. She’s a pro at online classes already. She sets the goals and I do the advocating and try to figure out how to make them work. The age requirement for dual credit classes is 14. Thus, the need to advocate. I can’t think about it too much or it blows my mind and I stress out and worry. She’s always been the one telling me that it’s ok.
Now, as far as childhood is concerned. I have heard more times than not, just let them be a kid. Well, I have learned along the way that there are different definitions of that. I am doing what makes Madison happy. Her path isn’t robbing her of being a kid. If I made her do what society defines as being a kid, she’d be miserable. We tried not doing much academically. “Taking a break.” It’s just not who she is. And my definition of what a childhood is is not hers. So when I mourn the ‘loss’ of her not being a kid, I’m just mourning something she doesn’t fit into. That’s not something to mourn. It’s something to embrace and be proud of, because it’s who she is and it’s what makes her happy. And don’t get me wrong, that kid still can’t go outside with getting muddy from head to toe, every.single.time. She’s definitely a kid. But she also enjoys putting together complex LEGO kits while listening to audio books in her free time or writing books. She’s totally self driven and it’s almost impossible to make her do anything she doesn’t want to do. I don’t have a handbook. There isn’t one for kids like this. All I have is the wisdom of those that have gone down this path before me and the peers that I learn from everyday that are figuring out the same path. I take their experience and keep it close to my heart. We are making it up as we go. And we are finally at the point where her goals that she set from the beginning are in sight. This article made me feel much better. When you have a child like this you have to trust them. Figure out how to provide what they need to accomplish their goals. Always follow their lead. And don’t think about it too much. Just understand it’s your reality and accept it. Even if it freaks you out. ❤️ Love then for who they are and support them 100%. Listen to them. When we started Third grade, Madison refused to hold a First Day of School sign that had a grade. 😉 Maybe she will in 2019-2020. LOl. I hope everyone is having a wonderful summer! We are winding ours down and gearing up for the new school year. Madison kicked her summer off with attending a YMCA camp on the lake. She enjoyed horseback riding, boating/tubing, the B.B. range, field games, and swimming. She came home dirty and tired each day. It was great! Madison had her Speech Tournament and came in First Place for Junior Persuasive. We were very proud of the effort she put into her speech and competing. She won a $250 scholarship for college by taking first place! She also enjoyed STARS camp and Summit. It was definitely worth the trip. Madison was able to meet her teachers in person, her classmates, and made new friends. ❤️❤️❤️ I cannot even explain how much of a difference this camp and weekend had on her life. She met her chess coach in person again. He is a wonderful mentor to her. She was thrilled to meet her favorite teacher, Dr. Kirsten Stein, in person. Madison takes classes at Athena’s Advanced Academy, and Dr. Kirsten is a phenomenal teacher. Madison is taking Philosophy and World Geography this Fall. Her class is filled, but if they get enough students the second class will be a go. Madison also got to meet Jim Weiss again this year. He is inspirational and she loves listening to his stories. During Summit Madison was able to meet her teachers and classmates for her Fall online Davidson Academy classes. Madison has kept busy this summer with planting plants into pots and taking care of them, playing chess, and continuing school. She is taking Pre-Algebra 1 through Art of Problem Solving, attending SQUILT live, and completed The Adventures of Huckleberry Finn, Elijah of Buxton, Microbiology and Cell Theory, and Genetics and DNA. She is currently working on Human Body Systems and ACT prep. Madison took a practice ACT test at home and did pretty well, so she is going to prep for it and take it this upcoming school year. Her goal was to take it when she was 12, but she’s ahead of schedule so…. My next post will be about raising a radically accelerated academic child. Madison really enjoyed dissecting an earthworm and then looking at its organs under a microscope. Madison has been pretty busy, but is always reading. This summer she has read Lad: A Dog , King Arthur: Tales from the Round Table (Dover Children’s Evergreen Classics) , and she is currently reading Twenty Thousand Leagues Under the Sea (Penguin Clothbound Classics) . We had some very sad moments this summer. Suzanne Nasser, the Director and Founder of DFW Speech and Debate passed away suddenly on June 28th. She was Madison’s mentor and was her nominator for Davidson Young Scholar program. We are still in shock and are very saddened. Jeff and Madison attended her memorial service and said it was beautiful. Suzanne was an amazing person who not only homeschooled her own children who her legacy will live on through, but she impacted thousands of other lives. Suzanne, we miss you and we will never forget you. Last week we had to say goodbye to our 15 year old cat Sebastian. That is never easy, but we know he is happy now and no longer in pain. We are looking forward to cooler weather and the normal routine of classes and activities to start! This post may contain affiliate links. Please see the disclosure policy. Madison wrapped up her Spring Semester by completing Intro to Latin, Philosophy, Political Systems, and Wordly Wise Book 7. She also finished her year long Introduction to Composition, which was an accredited course with an A. She will wrap of her Speech club with a tournament at the beginning of June as well. Language Arts: Huckleberry Finn, Elijah of BuxtonElijah of Buxton, and British Poetry. Science: Microbiology and Cell Theory, Genetics and DNA, and Human Body Systems. She will have time off in the summer for traveling and camps. Madison is super excited to attend STARS and Summit! Over the summer we will also cook with Madison’s Raddish Kids Cooking Kits. She loves the way the grocery list and instructions are laid out as well as the patch and the cooking tool that come in each kit! I like the homeschool curriculum that comes in a email each month for the box that is sent. If you would like to save $10 on a 6 or 12 month subscription please use the code RTKCS9. The Tinkercrate is another monthly subscription that Madison loves and she will continue to work on her latest Lego set endeavor LEGO Creator Expert Carousel 10257 Building Kit (2670 Piece). Madison’s also looking forward to competing in chess tournaments. She was 73 on the US Chess Top 100 list for girls age 10 in February and she’s moved up to 51 on the May list. I am still in the process of finalizing her summer book list and will post that in a separate post. As of right now, she is still reading Brian Jacques Redwall Series Set (Book 1-20): Redwall; Mossflower; Mattimeo; Mariel of Redwall; Salamandastron; Martin the Warrior; Bellmaker; Outcast of Redwall; Pearls of Lutra; Long Patrol; Marlfox; Legend of Luke; Lord Brocktree; Taggerung; Triss. As for Fall curriculum, Madison is going to take Prealebra 2, and Intro to Algebra A, Critical Reading and Writing, Biology, World Geography, and Philosophy. She will continue with piano lessons, SQUILT, and chess too. At the beginning of April, we took a quick weekend trip to College Station, TX to attend Physics Fest at Texas A&M. We pass through Waco, TX on our way so I decided we’d stop and visit things we have had on our bucket list on the way there and the way home. We drove down on Friday so we decided to stop and visit Magnolia Market at the Silos on the way. This is a market that was built by Chip and Joanna Gaines from the show Fixer Upper. There was a line to the bakery the entire time we visited and the market was rather crowded. It was nice out on the lawn area with the food trucks and they had live music. They also have a really nice garden area. It was a very nice place to visit and I’m glad we stopped. We had a wonderful dinner at the Messina Hof Winery right outside of College Station in Byran, TX. It was fabulous! On the way home we stopped again in Waco, TX to visit the Waco Mammoth National Monument. This is a must see in my opnion. They have guided tours that take you through the actual dig site. Here is a life size picture of a mammoth so you can see the actual comparison to the size of it to yourself. Amazing! We love Junior Ranger Badges and this was a fun one for Madison to get. After Madison completed her Junior Ranger Badge, her and her sister sifted and identified ancient ocean fossils. You get to keep what you find! This was definitely a fun trip and we made the most of our weekend getaway! Nothing can replace the value of hands on learning and I am very grateful we have are able to embrace these moments! This post may contain affiliate links. Please see my complete disclosure policy. We began using ALEKS in October and it is working very well for Madison. This is the first Math curriculum that we have used that hasn’t been frustrating for her or has caused tears. She took the 5th grade math pre-test and started out just a bit over mastering 50% of the course and finished by mid November. Then she took the 6th grade pre-test and again scored around 50% mastery and she is just now finishing that grade up. As soon as she completes 6th grade we will move on to 7th in the same fashion. They do offer a free trial so if you wanted to check it out, you can without a charge first. The Introduction to Composition class Madison is taking through YS Middle School Online is a year long course. She absolutely loves it. I cannot say enough wonderful things about interaction with the teacher, the students and how far she has come with her writing. We signed up for the next level class for next year. Madison is on Lesson 16 of the Wordly Wise 3000 Book 7. She uses the online version. We are now using Study.com for our Science and Social Studies. Madison was moving at a lightening speed with Acellus and she was finding errors. When I compared what was covered for the same subjects, there was an astounding difference. I signed up for the study.com free trial and Madison couldn’t pass the final exams for the same subjects she had just completed with Acellus. She felt somewhat defeated, but I am glad we figured this out now and not later. So, with that said…. Madison is taking Middle School Life Science and Middle School Physics. She is also taking Middle School Geography. The cool part about the courses that Study.com offers is that if they take the end of year exam, it will show you when you start the course what they need to learn and they do not need to do the lessons with the information they already know. Madison is also currently doing the Ancient Asia Moving Beyond the Page unit and then she will do the Single Shard unit. Madison learns best through videos, but she also likes to dig deeper with hands on projects as well. So, we are doing the study.com lessons and then when those are complete (or close to complete) we are going to start on her Moving Beyond the Page units. That pretty much covers the “core” subjects. Madison is taking a couple of other online classes. Introduction to Latin through Gifted Homeschoolers Forum is a huge hit with Madison. She picked this class out and she is really enjoying it. She is also taking Philosophy for Questioning Minds through Athena’s Advanced Academy and it is amazing. Madison is also going to begin The Electoral Process and Political Systems in March. Madison also does keyboarding with Touch-Type Read and Spell and vision training with Dyslexia Gold daily. Once a week she attends Homeschool PE and twice a month she has an online music appreciation class through Squilt. This semester Madison is participating in the DFW Speech Club. She has written and memorized a Persuasive speech and an Open Interpretation speech to compete in tournaments with and is also prepping to compete in the Impromptu and Constitutional Literacy categories as well. She goes to her club meeting once a week and will participate in tournaments in March and June. Next year she will be in the club all year versus just one semester. Another one of Madison’s favorite things to do is to learn and play chess. She does this many different ways. Madison is part of a local chess team and they participate in scholastic tournaments. They took Second Place in a tournament in January. They also take weekly online chess lessons from Chris Toolin. Madison also tries to participate in weekly local tournaments at North Texas Chess Academy when it works in our schedule. She takes weekly lessons from a Grandmaster through the Davidson Young Scholar Program. Madison also enjoys being a part of the Online Homeschool Chess Club. Madison also made the Top 100 Girls Age 10 US Chess Federation List. Madison also attends Catechism class at church weekly and takes weekly piano lessons. She just moved up a level and is excited for the challenge of new books! We decided to drop her co-op this semester. Loosing a day was making it hard for her to do all of her extra classes she signed up for this Spring and for her to have the down time she needs to be creative. We are continuing her Tinker Crate kits and she loves those as well as the Raddish cooking kits. The Raddish kits come with an email that includes a homeschool curriculum. It is a great value! Madison enjoys writing her penpal and participating in our local Mensa Youth activities when our schedule allows. She was able to fly a plane again and today she did an Escape Room event that was a lot of fun. Madison loves to create and so she has made some interesting things in her free time. The most recent has been a woman made out of mud and has a two-toned leaf dress and the other is re-purposing Amazon boxes. Madison is also in the process of tumbling her rocks to make into jewelry. It takes 4 stages and about a month of tumbling for each batch. I haven’t been able to keep a booklist for all of the books she has read, but recently she finished the The Wrinkle in Time Quintet Boxed Set (A Wrinkle in Time, A Wind in the Door, A Swiftly Tilting Planet, Many Waters, An Acceptable Time) and now she is reading the Redwall series. They stopped to take pictures along the National Mall. 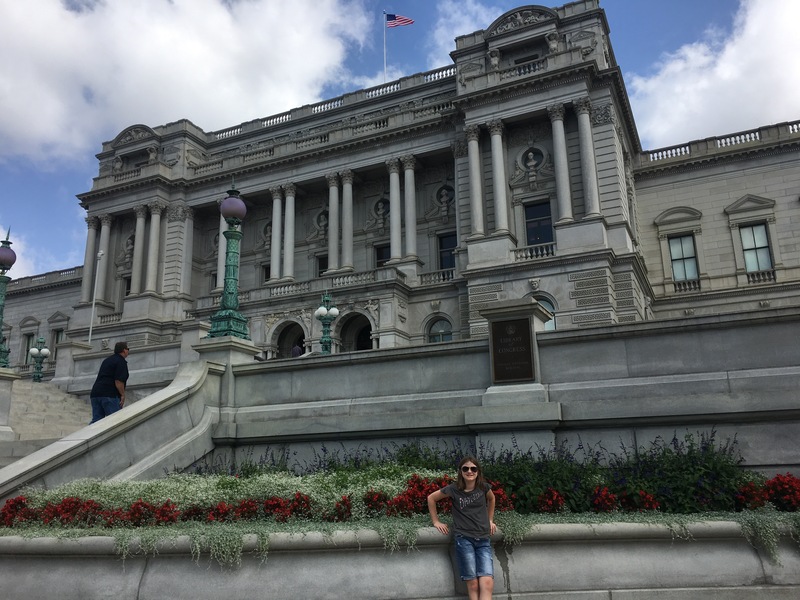 After we checked out of our hotel we headed to the Library of Congress. Before heading to the airport was none other than Madame Tussaud’s Wax Museum. We purchased tickets using our Explorer pass. Maybe I just like wax museums, but I thought this was a lot of fun. Some were much better than others, but being able to get up close and pose and have outfits to put on made it a lot more fun than just walking through and looking at them. I apologize in advance for the abundance of pictures. Madison really got into each scene so it cracked me up! I think she enjoyed this as much as I did! They have a bus seat after her wax figure that you can sit down in. When you do a light above you starts flashing and a voice of a bus driver comes on over a loud speaker telling you to move. Then it tells you to get off the bus. You hear sirens…it was surreal. An excellent part of the exhibit that really brings it to life. That sums up our trip to Washington D.C.! We had a blast and cannot wait to go back and do everything we didn’t get a chance to do!